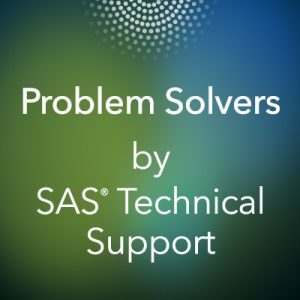 One of the great things about programming with SAS® software is that there are many ways to accomplish the same task. And, since SAS often adds new features that can make a task easier, it's important to stay informed. This blog shows a few samples of graphs and explains how you can use new functionality to make the old graphs look new again. 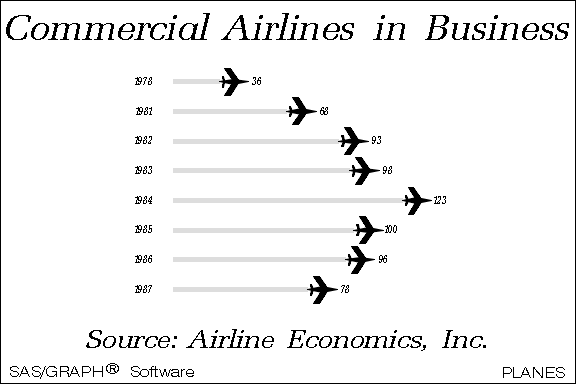 Over the past several releases, SAS has added more options and procedures for ODS Graphics. While your tried-and-true SAS/GRAPH programs still work, ODS Graphics can create modern-looking graphs with less code, while providing more output options. And, ODS Graphics is part of Base SAS, which means that all of these techniques work in SAS University Edition. Note: All the graphs in this blog are created using the fifth maintenance release of SAS® 9.4M5 (TS1M5). Not all options are available in prior releases of SAS. 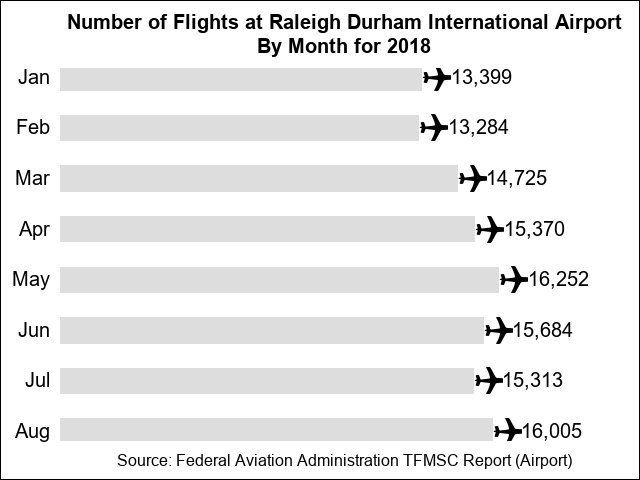 The following graph is created with the DATA Step Graphics Interface (DSGI), which draws the horizontal bars and airplanes as well as places the text. 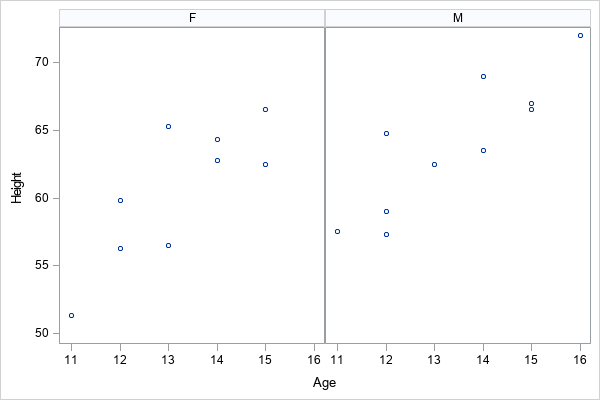 For information about PROC SGPLOT, see SGPLOT Procedure in SAS® 9.4 ODS Graphics: Procedures Guide, Sixth Edition. For more information about the SYMBOLCHAR statement, see the section "SYMBOLCHAR Statement" in the "SGPLOT Procedure" chapter of SAS® 9.4 ODS Graphics: Procedures Guide, Sixth Edition. The next example graphs show the results for a fictitious ice-cream flavor survey. 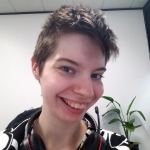 Because not all the ice cream flavors are present in each survey group, macro code is used to conditionally define the PATTERN statements based on the values in the data. I changed the colors for the bars in the PROC SGPLOT code so that the bar colors look more like the ice cream that they represent. I also added the DATASKIN= option for the bars to enhance the visual appeal of the bars in the graph. For more information about attribute maps, see the section Using Attribute Maps to Control Visual Attributes in the SAS® 9.4 ODS Graphics: Procedures Guide, Sixth Edition. 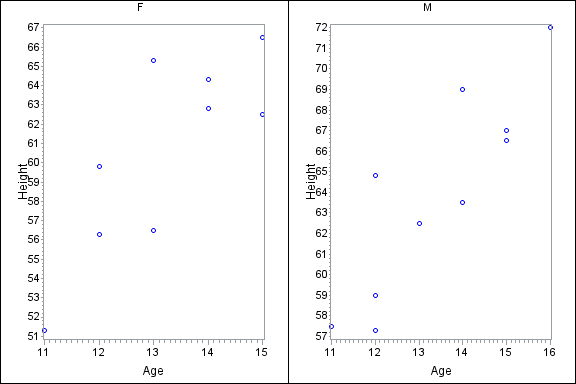 The following graph shows two plots that are created by using PROC GPLOT with a BY statement. The graphs are then paneled side-by-side with the GREPLAY procedure. 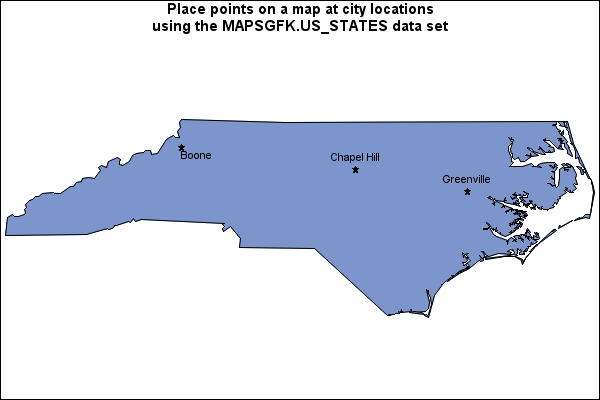 The next graph uses the Annotate facility with the SAS/GRAPH GMAP and GPROJECT procedures to place a symbol and city name at the location of select cities in North Carolina. Beginning with the fifth maintenance release of SAS 9.4M5 (TS1M5) in 64-bit Windows and 64-bit Linux operating environments, you can use the SGMAP procedure to create such maps. 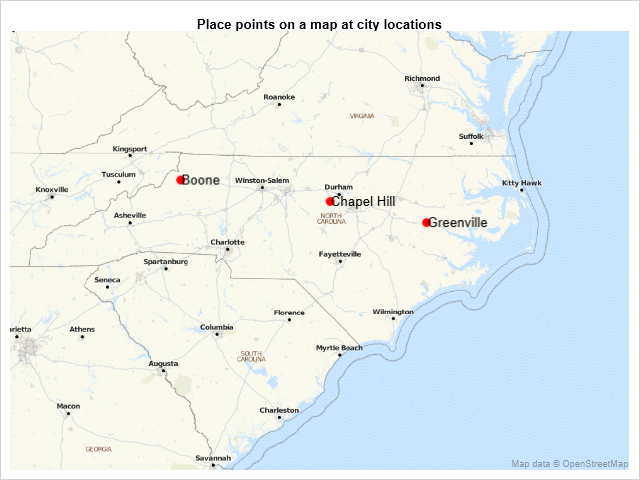 Using this method, you can create maps that show much more detail. Because the OPENSTREETMAP statement is used in PROC SGMAP, more detail (for example, cities and roads) is included in the map. The DUMMY data set adds coordinates to the points that are plotted to modify the display area of the map. For more information about controlling the display area of the map, see the article How to Control Map Display Area with PROC SGMAP. For more information about PROC SGMAP, see the SGMAP Procedure chapter in SAS/GRAPH® and Base SAS® 9.4: Mapping Reference. 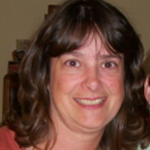 Many of these features have been covered in more depth within other blog articles. Visit these articles to learn more!